The IDBridge CT30 (formerly the GemPC Twin/TR) USB desktop reader from Gemalto integrates high quality and functionality with a contemporary design. This reader is fully PC/SC and EMV Level 1 compliant and supports all ISO 7816 microprocessor-based smartcards as well as many popular memory cards. The reader is compatible with previous Gemalto models such as the GCR410. The reader comes complete with WHQL approved Windows drivers, as well as support for other operating systems such as Linux and is perfect for many smartcard-based applications on desktop PCs. The IDBridge CT30 is compact and boasts performance to match many other leading brand readers. This unique transparent reader even allows you to see the card when inserted. 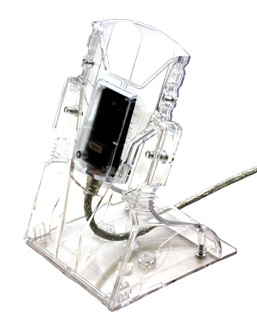 The reader comes complete with the matching (optional) stand that provides a convenient alternative mounting position to enable vertical card insertion. 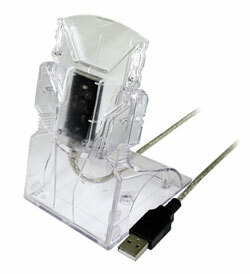 An additional desktop stand is available as an accessory. Supports all microprocessor-based smartcards using T=0 or T=1 protocols. Linux Redhat WS3.0, WS4.0, Suse Professional 9.2 & DEBIAN "Sarge"